Ludlow Avenue, named for Isaac Ludlow who surveyed the original plat for the town of Losantiville (Cincinnati) in 1788. St. Clair Street, named for Arthur St. Clair, first Governor of the Northwest Territory. One street even bears the original name of the city, “Losantiville,” as it was called when first founded in 1788 by Israel Ludlow, Matthias Denman, and Robert Patterson. 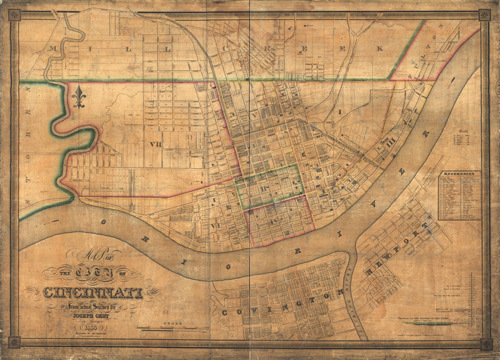 The name was changed in 1790 to “Cincinnati” by Arthur St. Clair, governor of the Northwest Territory. A general in the Revolutionary Army, St. Clair was a member of the Society of Cincinnati, an association of Revolutionary War officers. 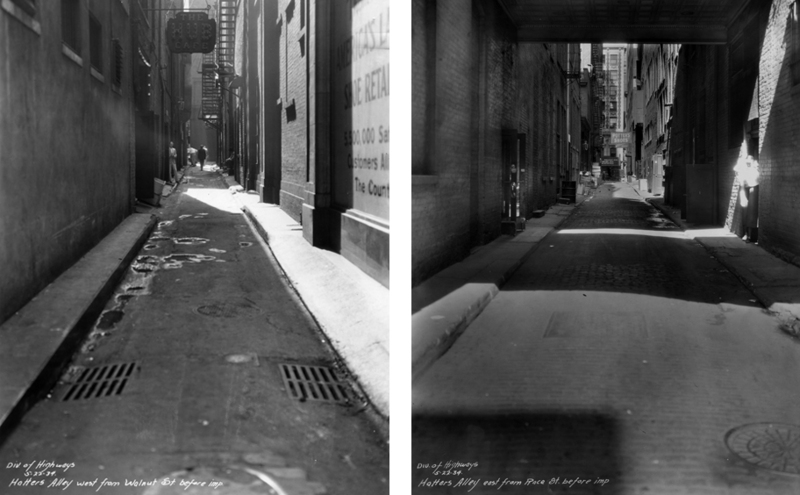 Losantiville Avenue, original name of Cincinnati when first founded in 1788; the name was derived by Mr. John Filson as a combination of the letter ‘L’ for ‘Licking’, the Latin word ‘os’ meaning ‘mouth’, the Greek word ‘anti’ meaning ‘opposite’, and the French word ‘ville’ meaning ‘city’, ‘L-os-anti-ville’, referring to the location opposite the mouth of the Licking River. The original plat of the town, as surveyed by Israel Ludlow in 1788, was established on a grid extending in a north-westerly direction from the Ohio River, across from the mouth of the Licking River. Streets that extended to the north from the riverfront were given names such as Walnut, Vine, Sycamore, Elm, or Plum. Streets that extended east-to-west, parallel with the river, began with Water Street, then Front Street, then were given a numerical numbering beginning with Second, Third, Fourth, and increasing numerically as they extended north from the river. As the city expanded outward, other names were derived from a variety of sources, including the names of other cities, such as Marietta, Trenton, Dorchester, Salem, Oberlin, Philadelphia, Lucerne, and Lancaster, to name just a few. In the downtown area, street names often reflected the types of business being conducted, including Commerce, Canal, and Court Streets, Hatter’s Alley and Cathedral Alley. A variety of names were used throughout the city with some reflecting the terrain, such as Rapid Run, Duck Creek, Overlook, Straight, Red Bank, Hillcrest or Spring, while others were more abstract, such as Arrow, Eastern, Grand, Sunset, Three Mile, or Winter. As mentioned in a previous blog, some streets have either changed names since they were first established or no longer exist, such as Laurel Street, Columbia Avenue, Carthage Pike, Front Street, and Lockport Avenue. Glancing through the old Farnsworth and Williams’ Cincinnati Directories, which have been scanned and are available online through the Virtual Library site of The Public Library of Cincinnati and Hamilton County, one can quickly see how the streets and avenues of Cincinnati have been aptly named to recognize and promote the distinguished history of the city. The earliest available of these directories was published in October, 1819 by Oliver Farnsworth and provided readers with historical sketches of the city and surrounding areas, “the most ample history of the original settlement, rise, progress and present importance of Cincinnati and its neighborhood, that has yet appeared.” The directory also contained “the names, profession and occupation of the inhabitants of the town, alphabetically arranged; with the number of the building occupied by each. Also, an account of its officers, population, institutions and societies, public buildings, manufactures, &c. with an interesting sketch of its Local Situation and Improvements.” Both the Farnsworth and Williams’ Street Directories have proven to be an invaluable resource for identifying dates and locations of unidentified photographs based on visual clues contained within the images.